Appreciate the sheer magnificence of the Red Centre, Uluru (Ayers Rock) and the stunning Kata Tjuta (the Olgas) formations from the air with your choice of either a 15, 30 OR 36 minute scenic helicopter flight. With pick up and drop off from your Ayers Rock Resort Hotel, there is nothing for you to do but enjoy this great spectacle and adventure when you arrive at Ayers Rock. 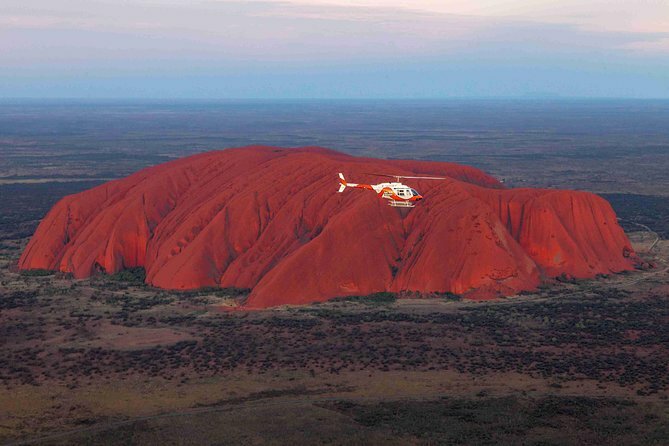 Rock Blasting Helicopter Tour (15 minutes): Blast off to Uluru! The helicopter takes off from a launch near Uluru (Ayers Rock). Below you'll see Ayers Rock Resort, the waterhole Mutitjulu, the surrounding desert, a panorama of breathtaking scenery unique to the Red Centre. Total duration approx. 1 hour. Uluru and Kata Tjuta Helicopter Flight (30 minutes): This longer flight offers the same views of the 15 minute flight - and much more! You will see Uluru (Ayers Rock) and the magnificent red desert all the way to the striking rock formations of Kata Tjuta, an Aboriginal term meaning 'many heads'. With Mt Olga forming the tallest, more than 36 massive, domed rocks make up this natural wonder, a gathering of fantastic, striated shapes, some recalling giants huddled in conversation. As Uluru is, Kata Tjuta is sacred to the Anangu people, and resonates with their legends and lore. Total duration is approx. 1.5 hour. Extended Uluru and Kata Tjuta Helicopter Flight (36 minutes): Prepare to be awe-inspired by the sheer size and beauty of these natural wonders. This flight is similar to the 30 flight, but offers more flying time. Anyone with an interest in Australia's Red Centre should see the sights from this angle. The views will provide you with the perfect opportunity to take spectacular aerial photographs with expert and detailed commentary supplied by your pilot. An absolute must for any photographer! Total duration is approx. 1.5 hour. Wonderful experience, flying around Uluru and Kata Tjuta! You really get a view by helicopter that you cant get any other way. Carmen, our pilot, was outstanding! She provided detailed commentary and was very thorough in her flight around both sacred sites. Would do it again in a heartbeat! We did the sunset flight so the red colours of Uluru and Kata Tjuta contrasted nicely against the desert floor which was remarkably green due to recent rains. The pilots were highly professional and provided just the right amount of commentary. Great job Nico. This was one of our best experiences in Australia. To view and photograph these sacred aboriginal sights from a helicopter was a once in a lifetime event. Our pilot was friendly and knowledgeable. The highlight of the tour was that a storm cloud was hovering over Kata Tjuta and pouring rain down on it as we approached which is something rare in this desert area of the outback. Our pilot was so excited he even got out his camera and was taking pictures of it. He said he had been doing this tour for 5 years and had never seen rain coming down on KataTjuta. It was truly amazing to see! Big rock in the middle of nowhere. Helicopter over it and drive out to it for a close up look. Flies can be bad and it will be hot. Don't need to spend more than one night, two at the most. Sails in the Desert best hotel but expensive. This was an amazing experience. It showed us the beauty of the area but also the relationship between the 2 sites. We were able to see where the old road had been and understood why that had been changed. Highly recommended. I can't imagine a better view of Uluru! Our pilot was very well informed and the view from both sides of the copter was beautiful! He was very mindful to ensure that all passengers received a full-view of both Uluru and Kata Tjuta. I would recommend to anyone! Can't really rate the tour as the Helicopter flight was cancelled due to the lightning storm. BUT what I have to mention. They REFUND ALL MONEY we paid in advance and tried hard to reschedule the flight. I originally booked a tour by day on a chopper above / around Uluru. I was informed on previous day SMS that there were not enough people on this tour. But for a reasonable extra-cost they could put me on a flight just before and during SUNSET,, same day, and not only around Uluru but also around Kata-Juta the sister mountain a few km around, which I had visited walk in valleys the day before. I accepted the deal. It was a wonderful flight. We were a total of three small-size choppers where each of three passengers has a window and the cell being narrow, we could see and shoot pixes on the other side. My only regret one star missing is that we did not fly ABOVE Uluru or Kata-Juta while other choppers from SAME company have come plumb to it I have picture of this. Maybe there was a safety problem to avoid vicinity of two contiguous helicopters, or, being the last one to take-off we had no time for it and had to return to heliport ???. But altogether, I highly recommend. I purchased this tour for my husbands 40th birthday present. A minimum of two passengers are required for this tour to operate. Bookings for single passengers are accepted, however if minimum numbers are not met, there is a possibility of cancellation after confirmation. In the event of this occurring, you will be offered an alternative or full refund.